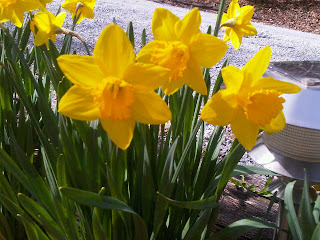 The spring wildflowers are starting to peek out along the Gatlinburg trail and the daffodils are blooming at The Foxtrot. The paper whites dance merrily in the breeze at the head of the driveway. Alvin, Fleur, and DeLis, our resident cats, chased each other in the sun shine, moving too quickly to catch in the photo. I’m surprised that Fleur didn’t lay in the middle of the flowers. She must prefer the flowers with pleasing aromas rather than bright colored blooms. Can spring be far behind romping cats and bobbing daffodils?